The motion of plates and continents on the planet’s surface are a manifestation of long-term mantle convection and plate tectonics. Present-day plate velocities provide a snapshot of this ongoing process, and have been used to infer controlling factors on the speeds of plates and continents. However, present-day velocities do not capture plate behaviour over geologically representative periods of time. To address this shortcoming, we use a plate tectonic reconstruction approach to extract time-dependent plate velocities and geometries from which root mean square (RMS) velocities are computed, resulting in a median RMS plate speed of over 200 Myr. Linking tectonothermal ages of continental lithosphere to the RMS plate velocity analysis, we find that the increasing portions of plate area composed of continental and/or cratonic lithosphere significantly reduces plate speeds. Plates with any cratonic portion have a median RMS velocity of, while plates with more than 25% of cratonic area have a median RMS speed of. The fastest plates (RMS speed) have little continental fraction and tend to be bounded by subduction zones, while the slowest plates (RMS speed) have large continental fractions and usually have little to no subducting part of plate perimeter. More generally, oceanic plates tend to move 2–3 times faster than continental plates, consistent with predictions of numerical models of mantle convection. The slower motion of continental plates is compatible with deep keels impinging on asthenospheric flow and increasing shear traction, thus anchoring the plate in the more viscous mantle transition zone. We also find that short-lived (up to) rapid accelerations of Africa (∼100 and 65 Ma), North America (∼100 and 55 Ma) and India (~130, 80 and 65 Ma) appear to be correlated with plume head arrivals as recorded by large igneous province (LIPs) emplacement. By evaluating factors influencing plate speeds over the Mesozoic and Cenozoic, our temporal analysis reveals simple principles that can guide the construction and evaluation of absolute plate motion models for times before the Cretaceous in the absence of hotspot tracks and seafloor spreading histories. Based on the post-Pangea plate motions, one principle that can be applied to pre-Pangea times is that plates with less than continental area can reach RMS velocities of, while plates with more than 50% continental fraction do not exceed RMS velocities of. Similarly, plates with large portions of continental or cratonic area with RMS velocities exceeding for more than should be considered as potential artefacts requiring further justification of plate driving forces in such scenarios. Zahirovic, S., Müller, R.D., Seton, M. and Flament, N., 2015. 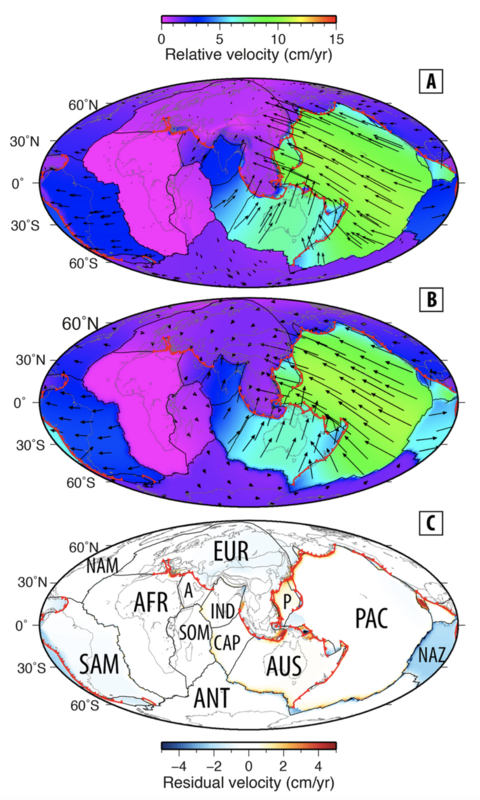 Tectonic speed limits from plate kinematic reconstructions. Earth and Planetary Science Letters, 418, pp.40-52.